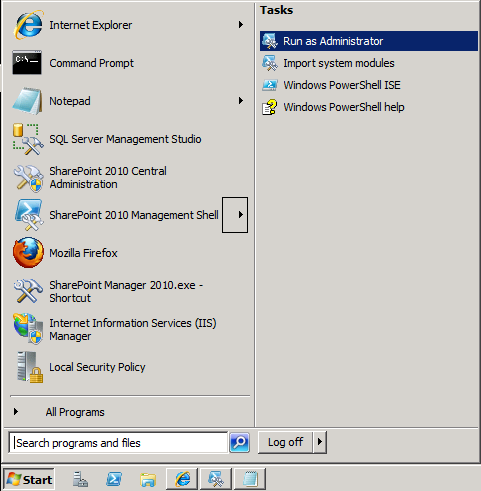 Open the SharePoint 2010 Management Shell and Run as Administrator. Tom suggested an improvement in the comments here, which I agree is better! Run Get-SPServiceApplicationProxy to enumerate the IDs of all the Service Application Proxies in your farm. Copy the ID for the WSS_UsageApplication. Run the following two lines of PowerShell. I’ll try to track this issue as updates come out. Thanks, this was exactly what I needed. Thanks Tom! I agree, that’s an improvement. PowerShell is definitely not my strong point. I’ll update my post. Cheers! Thanks! This worked perfectly for me. Excellent post. Helped a lot. Tristan – This worked great. Thank you for posting.! You can automate the GUID for the proxy as follows if you only have one proxy. Hi Eric. Why do we need the last two lines and how does this automate the process? I’m not following. The first two lines should do the trick, no? The last line uses a var instead of having to copy and paste in the ID. Just run the lines together, no need to copy and paste GUIDS. A lot faster, just copy and paste the code and watch it run. I think I left off $UP.Provision() at the end too. Anyways, I used your code, but just got the GUId as a var and used that var’s ID later so I didnt have to copy/paste. Gotcha. I think that’s what the update in the post above does as well though? It’s taken from a comment from Tom above. Thank you so much.. you saved my day..
For me, the service proxy did not say it was started on the applications page, but via powershell its status said ‘online.” I hope that means it will eventually update on the UI. “WSS_UsageApplication ” is not there in the list , what to do?? Fixed my problem .. Cheers !!! Works for SharePoint 2013 too. Thanks! Fixed my environment, and work for Sharepoint 2013 too. Great Post, have used this post a few times. THANK YOU! This worked as designed and specified. Thank you for being so detailed and specific. It made for execution of the proxy fast and simple! Thank you!